Improved performance and engineered solutions have often been accomplished by incorporating advanced materials and technologies into our product lines. 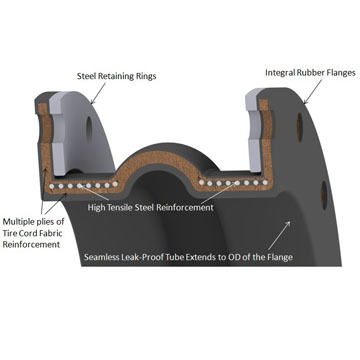 General Rubber is proud to offer a variety of elastomers and construction materials chosen specifically to meet the needs for even the most demanding applications. From advanced DuPont elastomers to cutting edge construction materials, General Rubber’s performance products are engineered for success. Outstanding water, vapor, and weather resistance. Good resistance to heat, ozone, alkalis, sunlight, and oxygenated solvents. Ideal for outdoor service. Do not use with petroleum oil service. Good general purpose elastomer with an effective operating range from -30°F to 350°F. Resists alkalis, inorganic acids, and salt solutions. Flame retardant, as well as abrasion and weather resistant. Good resistance to animal and vegetable oils; moderate resistance to petroleum oils. Effective operating range from -20°F to 225°F. Lowest permeability, very good resistance to water, heat, fats, ozone, alkalis, sunlight, abrasion, and oxygenated solvents. Effective operating range from -30°F to 300°F with brief allowable excursions to 350°F. Offered superior weather, flame and abrasion resistance as well as excellent resistance to acids, alkalis and oxidation with an effective operating range from -10°F to 250°F. While DuPont has discontinued Hypalon®, a variety of elastomers of equivalent performance are readily available for specific applications. General Rubber is pleased to assist you in this regard. Good resistance to mineral and vegetable oils, greases, hydrocarbon solvents, dilute acids, and alkalis. Effective operating range from -10°F to 210°F. Has a wide service temperature range from -40°F to 302°F, and resistance to fluids of various chemical compositions, as well as excellent resistance to alkaline and aggressive fluids. HNBR also has improved wear and abrasion resistance and improved ozone resistance of up to 5 times that of standard NBR/Buna-N. It uniquely bridges the gap in oil applications where the temperature was too high for NBR/Buna-N and otherwise forced the use of the much more expensive FKM compound. Excellent resilience and rebound elasticity with high tensile strength. Excellent resistance to tear and abrasion. Effective operating range from -40°F to 180°F. Superior chemical resistance, completely inert to nearly all industrial chemicals and solvents. Effective operating range from -60°F to 450°F. Teflon® is used when indicated or specified. Excellent resistance to aggressive chemicals, solvents, and halogenated hydrocarbons. Viton® TBR-S provides excellent resistance to steam, aqueous acids, amines and concentrated caustics/bases/alkalis. Viton® ETP-S offers the most universal chemical resistance and has excellent flexibility at low temperatures. Effective operating range from -10°F to 400°F. Several white and black elastomers meet FDA requirements and can be used in direct contact with food, beverage, and pharmaceutical products. Tire cord can be oriented in an optimal bias ply minimizing body thickness while also increasing movements and decreasing spring rates. The Resorcinol Formaldehyde Latex (RFL) coating ensures a superior rubber bond and prevents delamination. Polyester and Nylon are economical in service conditions up to 300°F. Kevlar®/Aramid has a higher tensile strength and good for service conditions up to 400°F. Economic reinforcement also serving as an insulation layer for applications reaching 1200°F. Whether it is internal reinforcement or external restraints, high tensile steel will reduce the cross sectional area contributing to a more efficient design. Retaining rings and control unit materials include but are not limited to carbon steel with hot dipped galvanized or other coatings—stainless steel (304/316) and aluminum bronze to name a few.